Home / Technology / Video / This latest technology will allow you to roll up a TV screen without breaking it! This latest technology will allow you to roll up a TV screen without breaking it! In the year 2013, LG Electronics Company introduced the Organic Light Emitting Diode "OLED TV". And this was really favored by their customers. Organic Light Emitting Diode TVs is lighter, thinner and now the better-performing than any opposed invented television technology. As of now, the LG finally showed us the latest OLED TV that teased us for a long period of time, their newest invented TV is currently introducing its efficiency in the market and it is the LG Rollable Organic Light Emitting Diode TV. 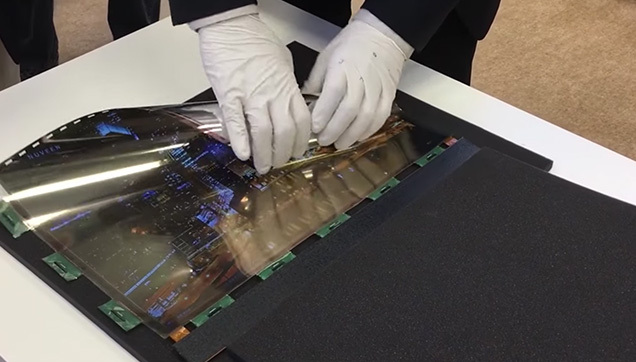 Rollable OLED TV is more efficient and trouble-free to carry than any other television that was invented, it can be fold and rolled up that you can put inside your bag where you can take it anywhere. It is an amazing 18 inch display rollable television it tightly rotates in a cone shape and bear all its weight by a black stand. On its display, the images also dances and rolls as the screen rotates. Rollable is the capability of rolling and yes! Rollable Organic Light Emitting Diode TV can be rolled up into a scroll. This might be the future television for the next few years.